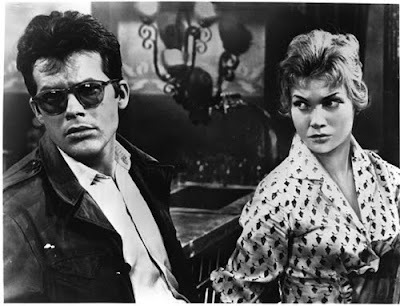 Zbigniew Cybulski, the Polish James Dean, as Maciek in Andrzej Wajda's seminal war movie, Ashes & Diamonds, based on a novel by Jerzy Andrzejewski. Cybulski, a great star until his untimely death in 1967 when he was killed leaping for a train, enjoyed his most iconic role here as a resistance fighter with the anti-Marxist Home Army, charged with assassinating Szczuka (Wacław Zastrzeżyński), the new district secretary appointed by the incoming Communists. Having botched the hit, taking out two cement plant workers by mistake, Maciek struts and frets about the bar of the Monopol hotel unable to decide whether or not to try again, a Hamlet in shades. Wajda's film is set over the course of one night, 8th May 1945, with Poland on the cusp of history following Germany's official surrender. It's a transitional moment and ultimately one of pragmatic compromise. The country's citizens are at once liberated, triumphant and privately harbouring grave doubts about exchanging one totalitarian dictatorship for another. Ashes & Diamonds is beautifully shot in bleak, noirish tones. When Maciek's impromptu date with barmaid Krystyna (Ewa Krzyżewska) takes them amid the rubble and desolation of an old church, the landscape suddenly recalls the crumbling Vienna of Carol Reed's The Third Man (1949). That scene, in which a statue of Christ hangs upside down from the rafters, is one of only a handful that feel consciously stylised. Another is the expressionistic burst of fireworks that announce Szczuka's bullet-riddled corpse hitting the pavement. Maciek's death is one more - winged while sprinting away from enemy soldiers through a labyrinth of billowing laundry, he finally falls to his knees and breathes his last in a festering rubbish tip. This ending might have pleased state censors, watching a murderous dissident get his comeuppance, but to the rest of the free world it only confirmed Maciek's place as one of cinema's greatest tragic anti-heroes, romantic, idealistic and longing for a better world. In truth, Maciek is an angsty fifties youth in a forties context but the anachronism hardly matters. "Nobody has ever had an effect on me as Cybulski did. We worked closely together very often and very closely at the beginning of my career. He was my collaborator. We always discussed new films and developed ideas together. Cybulski was the kind of actor who brought to films his own character, his own individuality. He was almost incapable of playing someone wholly invented by a writer; he always played himself. That's why he was so irreplaceable. Even after his death I felt he was still with me, planning my next film. I thought about him constantly. I was shocked when I realised that it was impossible to make another film with him, that his character would never again appear on the screen. At that instant I understood that each of us is exceptional; when someone dies, something unique disappears from the universe. There is no replacement for the individual human nature."